I’m looking for a plush 3 1/2 inches tall 1975 Wallace Berrie owl. 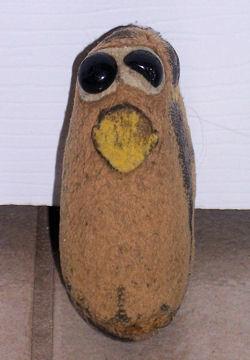 It is brown with a flat, yellow felt beak, black plastic eyes, and medium brown fur. 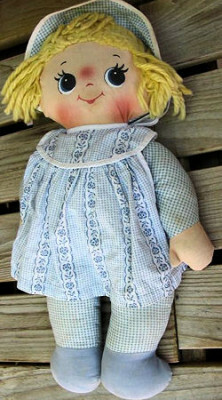 I’m looking for a 12 inch blond 60s Knickerbocker cloth doll with big round eyes, wearing a pink and white gingham dress, and a musical wind up in her back. I’m looking for a 24 inch cartoonish looking 70s white bear in a white furry jacket over blue smooth skinny body except for the furry feet, hands, and head. I’m looking for a 12 in cloth firmly stuffed beige or brown 70s upright dog, probably with floppy, black ears, short snout, and maybe button nose and mouth. 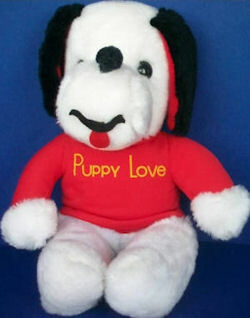 I’m looking for a 70’s Puppy Love dog, firmly stuffed, with moveable arms and legs, black puffy ball nose, wearing a built in red shirt with yellow words. I’m looking for a 70’s plush egg shaped character with long pink hair, large bulgy eyes, and green duck-like feet attached directly to the body.